Omid Nourizadeh also known as Omid 16B, is an artist whose passion for cutting edge electronic music is unrivalled. As a DJ and producer, songwriter, musician and label boss, Omid has forged a unique and prolific career as one of the world’s most talented and respected musicians and producers. He’s much regarded as one of the leaders who pioneered the tech house movement back in the early nineties, alongside the likes of Carl Craig, Vince Watson, Craig Richards, Mr C, Steve Bug and Francois K .
Growing up in London, with Persian roots, Omid was influenced by the likes of Jimi Hendrix, The Cure, Depeche Mode, RIDE and The Mission. 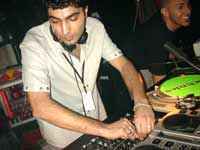 With an impressive discography of singles, LPs and compilation albums released on his own imprints, as well as signed to the likes of Eye Q, Hooj Choons, Stomp/EQ, Yoshitoshi, Ministry Of Sound, Tsuba and Bedrock, Omid has maintained the highest quality throughout his prolific career… without any commercial compromise. Known to produce under a number of pseudonyms including Phaser, 16B, Pre 4, OTC, Changing Shape, Sixteen Souls, $16 Million Dollar Man and Omid 16B, Omid started a new wave of influential releases as 16B which saw his early breakthroughs; the underground hit ‘Trail of Dreams’ on StrongHouse, the critically acclaimed ‘Secrets’ on Alola and his debut album ‘Sounds From Another Room’ signed by Ben Bodie to Sven Vath’s EyeQ records and released in 1998. The huge impact of ‘Water Ride’ saw 16B reaching to a wider audience, with further singles “Black Hole” and “Falling” bringing in remixes from the likes of legends like Andrew Weatherall, Stacey Pullen and Deep Dish (Dubfire & Sharam). It was also around the same period when Omid’s more diverse ORN moniker released ‘Snow’ first on Alola whicih was quickly snapped up by James Barton head of A&R at BMG Deconstruction .With a new mix of “Snow” added by Omid himself, Deconstruction turned it into a national hit and marked Omid’s first major label breakthrough around 1999. Further LPs followed for Glasgow’s “Under The Counter” label as $16 Million Dollar Man in 2000 with Killer Tech House Bombs like “Seriusex” and “Pink Yo Black” released as singles, with the second 16B album shortly after titled ‘How To Live 100 Years’ with UK leaders Hooj Choons in 2002. Omid achieved further success with his “Escape” track where Richard Morel’s collaboration on the vocals led to the hit single ‘Escape (Driving to Heaven)’, which to this day is regarded as one of the most unique and influential tracks of our time. Omid has put his touch to artists such as Lana Del Rey, Morel, Natasha Atlas, The Cure, Gus Gus, UNA, Creamer & K, Danny Howells, François Kevorkian, Steve Lawler through to Pete Moss, Groove Armada (previously called Rumpus), Telex and DeepDish. Whether it was remixing Depeche Mode’s ‘Enjoy the Silence’ or Prince’s ‘Kiss’, Omid’s bootleg-style assaults have also made him well known with fans of different genres or styles. 2011 and 2012 saw the release of the “At Night” EP and the double-A-side ‘Rain / Passion of Zorro’, as well as the follow up ‘The Night / Electronics’ on John Digweed’s Bedrock imprint, and a furious touring schedule including show at Carl Craig’s Planet E stage at Snowbombing, MTV festival in Croatia, SW4 main stage in London, DJmag’s 20th anniversary show at Space Ibiza, Bestival and the Space Closing party. With his undeniable ability and impeccable pedigree, considered alongside his impressive discography and esteemed reputation, Omid 16B is a formidable talent and a true pioneer on the international dance circuit. Brother of Navid Nourizadeh & Nima Nourizadeh.